Welcome to the coolest page on AthleteBiz! Daily Challenge: Be a part of someone around you experiencing joy! Born and raised in Athens, GA, Jarryd attended Oconee County High School where he was a standout runner and state champion. It is at this point that Jarryd's story takes a different turn from many elite track & field athletes. During his senior year, he was diagnosed with Chronic Compartment Syndrome following bouts of pain in his legs. Eventually electing to have surgery, Jarryd was hopeful to no longer run with pain. Complications with the initial surgery led to many more operations, and after nearly three years, in June 2010, Jarryd went in for the single below knee amputation. 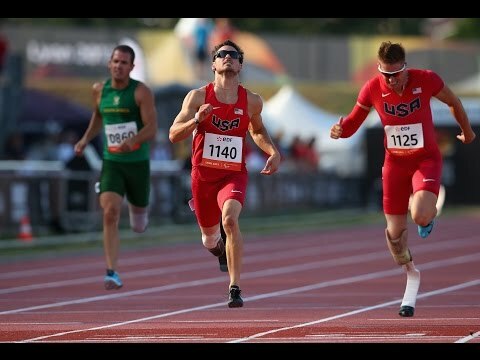 Jarryd now competes in the T44 class, and is a 2012 Paralympic finalist, 2013 Paralympic World Champion in the 200m and 4x100m (setting World Records in both events), and 2014 Paralympic Champion in the 100m and silver medalist in the 200m. Currently studying at the University of Georgia toward a degree in Sports Management, Jarryd's mission is to live a life full of joy. His passion for growing awareness and opportunities for Paralympic Sport is evident through his foundation, A Leg in Faith. Regarding his drive on and off the track, Jarryd says, "I've never been one to become complacent and I've always had a desire to learn. Whether it is after a WR performance or a PR in an event there are always things to learn. In both life and sport, great people have been placed in my life to learn from. But, if my goal is always to be 'filled up,' I will lose out on the greatest opportunity of joy - to 'pour out myself' by serving others."